Are You Covered by the BIR's Electronic Filing and Payment System (eFPS)? The Bureau of Internal Revenue (BIR) is keeping up with the digital times and has developed electronic systems for selected groups of taxpayers to file and pay their income taxes via the internet. For these groups of taxpayers, using the BIR's electronic platforms is not just an option but a must. Failure to do so could result in penalties equivalent to a quarter of the tax due. If your tax due is a million pesos, that means a penalty of Php250,000. That is on top of another Php1,000 worth of penalties to be paid per return. The BIR has two electronic platforms for preparing, filing and payment of taxes. The first is called eFPS, which stands for Electronic Filing and Payment System. It is used for filing tax returns, including attachments, if any, and paying taxes due thereon, specifically through the internet. The other platform is called eBIRForms, which is a tax preparation software that allows taxpayers to accomplish or fill up tax forms either online or offline. Instead of the conventional manual process of filling up tax returns on pre-printed forms that is highly susceptible to human error, taxpayers can directly encode data, validate, edit, save, delete, view, print and submit their tax returns. 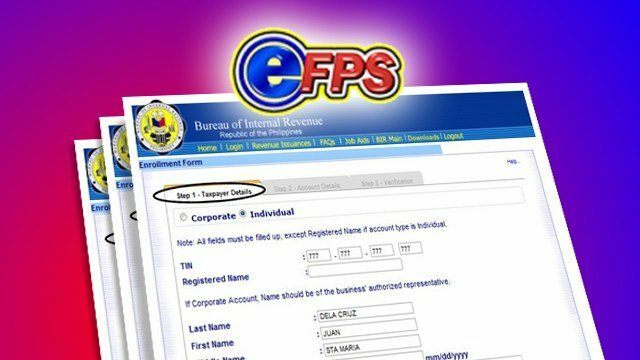 Ahead of the deadline for filing of 2016 income tax return on April 17 (which was moved from the usual April 15, which falls on Black Saturday, a non-working day), we're running the list of those covered by either eFPS or eBIRForms. These were based on Annex A of BIR's Revenue Memorandum Circular No. 28-2017 issued on March 30, which contains guidelines for the filing of 2016 income tax returns. Those who are not covered by either eFPS or eBIRForms can still file their income tax returns manually using printed forms from the BIR. However, those with internet access can opt to download the forms from the BIR website, print the forms and fill them up manually. It's also possible to fill up the income tax return form online and print a computer-generated income tax form. But whether you're filing manually or electronically, it makes a lot of sense to file your returns early. If there are long lines at the BIR offices for manual filers, electronic filers also experience long waiting times for BIR's computer servers if hundreds or even thousands of them try to use the online system at the same time. What are the Best Business Grad Schools in the Philippines?